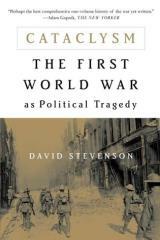 David Stevenson's widely acclaimed history of World War I changes forever our understanding of that pivotal conflict. Countering the commonplace assumption that politicians lost control of events, and that the war, once it began, quickly became an unstoppable machine, Stevenson shows that politicians deliberately took risks that led to war in July 1914. Far from being overwhelmed by the unprecedented scale and brutality of the bloodshed, political leaders on both sides remained very much in control of events throughout. According to Stevenson, the disturbing reality is that the course of the war was a result of conscious choices - including the continued acceptance of astronomical casualties. Cataclysm is the definitive history of the man-made catastrophe that left lasting scars on the twentieth century.